• Zippered Front and Top Loading Door. • Dimensions 17 X 10 X 10. Black Color. • Features Adjustable Shoulder Strap and Exterior Rear Pocket. • Zippered Front Door and Top Loading Door. • Fits Pets Up To 9 Tall. 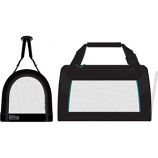 • Dimensions: 18 L X 11 W X 11 H.
• Conveniently Folds Into Carrying Case. • Can Be Used Outdoors, Water-Resistant Canvas. • 4 Ground Stakes Included. • Climate Control On All 4 Sides. • Dimensions: 18 X 14 X 16. Taupe and Coffee Ground Brown. • Durable Quilted Nylon Construction. • Front and Top Entry. • Seat Belt Safety Strap Fits Conveniently Over Upright Luggage Handle. • Washable Faux Lambskin Liner. • Fits Comfortably Under Cabin Seat. Carry your pet along in style with our fashionable FurryGo Pet Shoulder Carrier/Bag. Mesh zippered closure keeps your pet cool, safe and well ventilated. Made from Durable 600 Denier Oxford is very easy to maintain and the outer fabric is water resistant. Harness hook ensures your pets are safe and well bound to the bag. The Pet Shoulder Carrier/Bag has three exterior pockets for things you would like quick access to. The removable plush mat provides your pet with maximum comfort. Pet Shoulder Carrier/Bag is recommended for pets up to 13 lbs. The FurryGo Pet Shoulder Carrier/Bag has been manufactured by Iconic Pet, creator of high-quality products.